Apple has improved the lock screen experience with iOS 10. You'll now be able view your lock screen just by picking up your phone, as well as action notifications using 3D Touch. These features aren't quite as revolutionary as Apple is making out, but it's good they're finally landing on iDevices. Talking of 3D Touch, Apple is filling out the usage of its big hardware addition of last year's iPhone 6S. You'll be able to press and hold firmly on app icons to bring up widgets - essentially providing you with key information without actually entering the apps. Apple and open source software aren't normally found in the same sentence, but the Cupertino-based firm's hand has been forced to a certain extent and it's releasing the Siri API to the developer community. Some of the third-party integrations coming include Uber, WhatsApp, Skype and Slack. If you enjoy talking to your phone, this is actually kind of exciting. There's a bunch of new AI functionality coming to Apple's native Photos app, including new facial and location detection capabilities, more powerful search, and a new tab called Memories that will turn your photos into highlight-style reels based around things like location and people. We'll have to see how this one pans out in the flesh – it sounds like a nicety rather a game-changer (and is more than a bit reminiscent of HTC's Zoe), but let's not poo-poo it before we've tried it. There's some aesthetic tweaks, too, but more meaningfully there's loads more predictive functionality – things like nearby dining suggestions. There's also improved navigation, including traffic report integration, so Maps will now be able to offer you alternative routes when there's loads of congestion – all of which is coming to CarPlay too. As with many other areas of iOS 10, Apple is integrating third party services into Maps. You'll be able to make dinner reservations with restaurants from directly within the Maps app, for example. iOS will feature an all new native app called Home. Expanding on the HomeKit framework, it'll be one-stop shop for all your connected and smart home gear. It'll also feature in the Control Center, so you can access it from the lock screen. In iOS 10, Messages is getting a pretty substantial overhaul. You'll be able to write messages in your own hand-writing, alter the way message bubbles look, send quick 'Tapback' responses, and even add animations. Emoji are getting bigger (three times bigger) and easier to insert, with iOS recommending potential word replacements for you. Meanwhile, you'll be able to slap virtual stickers all over your message threads. But potentially the biggest addition of all will be iMessage apps. Apple is essentially turning the app into its own platform, with third party developers able to make their content accessible directly through the Messages app. We knew this one was coming, but it was good to see confirmation that Apple is going back to the drawing board with Apple Music nonetheless. Apple Music's new approach looks a lot cleaner and simpler than before. Upon entering the app, for example, you'll be taken straight to the Library section. Apple has made a couple of alterations to the iOS 10 Phone app. Chief among them is the way it transcribes your voicemail messages. It'll also be able to detect when an incoming unknown caller is likely to be spam. There's a chance you're one of the ten people who actually use Apple News. If so, you'll be interested in this one. It's receiving an Apple Music-like design overhaul, with similar chunky titles. Subscriptions and breaking news notifications are also incoming. Apple Pay is making its way to web purchases with iOS 10. There'll be a new 'Buy with Apple Pay' button appearing on website checkout screens, which will mean you can authorize payments using the Touch ID fingerprint sensor. iMessage in iOS 10 gains lots of new functionality, including gif libraries. iOS 10 has a multitude of new features, but many rely on 3D Touch which is restriction to the iPhone 6S range and newer. Within just days of release of iPhone 7, Apple has released the newest upgrade to their OS i.e., the iOS 10. The upgrade is made available for iPhone 5 or newer and iPad 4 or newer, which means we finally bid goodbye to our beloved iPhone 4s. The size of the upgrade significantly large, somewhere around 850 MB. So makes sure, you got space. After installing, the iPhone restarts, asks a few passwords and welcomes you to the home screen. What you initially might have missed out, is that Apple finally let go off its very popular ‘swipe to unlock’ feature with this upgrade and replaced it with ‘press to unlock’. The new gesture is hard to get to use to but well, it’s seemingly cool. After that, what you encounter next is the new ‘Home’ app. As the name suggests, the app is a homekit app and is your go to place to manage all your smart home gadgets in just one place. Kinda cool for Apple to bring in something new and probably employable in daily use, to the smartphone world. Another new feature with iOS 10 are the new widgets that appear with swiping left onto the home screen. Apple has been continuously remodelling its widgets appearance and hands down, it has never been disappointing. With the new customisable widgets, it gives a lot of power to the user which is mostly the aim of any new upgrade. Swiping down, we are faced with another new change. The ‘Notifications’ feature has also been stylised with this iOS, quite handy but takes a little time to get used to. Getting into more details the complete makeover of the ‘Photos’ app is a remarkable change. It’s been long since any of Apple’s previous updates touched that area and as you can see it has quite been changed and for the better good. It’s easier and a bit sassy too. The other new welcomed changed is that of the ‘Messages’ app. One of the most primer sources of communications between iPhone users, Apple’s ‘Messages’ app has been improved significantly. Designed to compete strongly with Facebook’s ‘Messenger’ and ‘Whatsapp’ app, ‘Messages’ now allows third party integration alongside exciting additions such asGIF messages, handwritten messages, photo messages with doodles, messages with laser light (digital touch messages) etc. Welcoming a list of changes, the ‘Music’ app has also been reorganised. Bolder and clearer, using ‘Music’ has actually become a lot easier since the last update, iOS 9. It’s not clumsy and traversing music has gotten a plenty of simplification. Last but not the least, iOS 10 finally lands its users the authority to remove built-in apps and rid the iPhone of unnecessary factory installed apps. So long, ‘Stocks‘. iOS 10 offers the users a fresh new experience of Apple’s ever changing technology,without actually having to force them into buying the newest smartphone. The inclusion of new features that are comparatively old to Google’s newest Android, the efforts are not completely redundant. They add to the whole Apple experience more than any other upgrade up until now. There’s a lot of scope of developments in Music as well as in the Notifications scenario of iOS but, for now, the changes are welcomed. 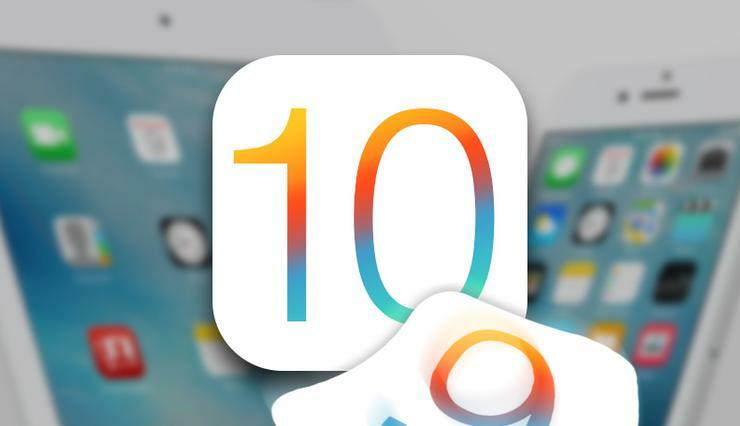 Apple unveiled iOS 10, the next-generation operating system for the iPhone, iPad, and iPod touch, on June 13, 2016, releasing it to the public exactly three months later on September 13. 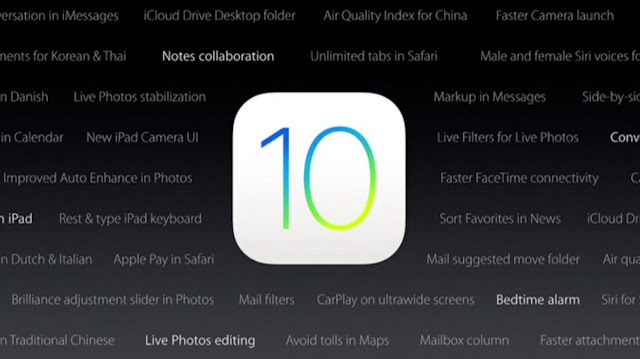 At the introduction, Apple CEO Tim Cook described iOS 10 as the "biggest release ever" for iOS users, and the operating system includes major updates for a wide variety of apps, services, and features, including Messages, Siri, Photos, Maps, Apple Music, News, Apple Pay, Control Center, and more. IOS 10 letting you copy and paste content across devices. Stop SMSing yourself that crucial bit of text or photo. It makes sense for content to live on multiple devices via the clipboard, and that's what will happen with iOS 10 and macOS Sierra. Apple's QuickType keyboard now understands context. What that means is that, for example, if a friend asks where you are, the keyboard will realize that and suggest you send location data, which you'll be able to do at the tap of a button. Siri is basically becoming a part of your keyboard. In fact, the keyboard will learn new works as time goes on, so if you type anything it will realize not to change. It will also know when you might want to schedule something in your calendar. All in all, your keyboard is going to become a whole lot more helpful. QuickType proactively gives you information it thinks you'll need, so you'll no longer have to look for it yourself. Contacts and your location are just one tap away. Until now, to access the camera you've had to slide from the bottom corner up. Now you'll be able to swipe from anywhere on the screen right to the left, which will automatically pull up the camera. It's a much bigger gesture target. Apple understands how important quick access to the camera is -- that's why it included camera access from the lock screen in the first place. This update should make taking a snapshot that much easier. You won't need precision to get to the camera app as soon as possible -- simply take your phone out and swipe to it. When you are browsing a web page in Safari on the iPad you can now open up two pages next to each other. Press and hold on a link and then choose Open in Split view launching two web pages next to each other. You can use each page independently. It’s awesome for comparison shopping. When you pick up your iPhone, you can now see all your notifications without pushing a button. Raise to Wake is on by default, but you can turn it on in Settings -> Display& Brightness -> Raise to Wake if it isn’t already working. This allows you to quickly see your new notifications without pushing the home button or power button. With iOS 10 your iPhone knows when you get out of a car that has been driving and then marks the spot in Apple Maps. You’ll see a notification on your screen showing where your parked car is at. With iOS 10 there are new 3D Touch features or Notes. One of the best is the 3D Touch Quick Action that allows you to create a new checklist. Whether you use this to make a daily to-do list or use it to make a grocery list every few days — it’s an awesome addition. This is only available on the iPhone 6s, iPhone 6s Plus, iPhone 7 and iPhone 7 Plus. iOS 10 now lets Siri tell you who is calling you. You can set this up to happen all the time or simply to have it tell you when you are using headphones or connected to the Car. Go to Settings > Phone > Announce Calls - Choose when you want to hear a caller identification. About 10 to 30 seconds after someone leaves you a voicemail in iOS 10 you’ll get a transcription of it in the Phone App. Go to check your voicemail like you normally would, but instead of pressing play, you can read the voicemail. This is in beta, so this isn’t 100% reliable, but it is good enough in many situations. You can rate voicemail transcriptions to improve the service. You can edit Live Photos in iOS 10. Now you can crop, edit and even add filters to Live Photos without losing the Live part of the photo. Take a Live Photo and tap on edit. That’s all there is to it. You can also turn off the Live part of the photo if you don’t like it. Siri can look up photos for you using a variety of search options. This includes asking to see photos of a specific person, but also on a specific date or at a specific location. Hold the home button to access Siri and say, “Show me photos from Hawaii.”, or a similar command to make this work. You can send handwritten notes through Messages on iOS 10. These appear as a written message on the other user’s screen. You can choose from pre-written beautiful handwritten messages or you can scribble out your own with your finger. You can turn your phone sideways to landscape to see these options, or you can access it by tapping on the App Store icon in Messages. You can speak messages in iOS 10, similar to how you could in iOS 9. This isn’t dictation, but actually sending a short voice message inside Messages. Apple changed how this works in iOS 10. Go to Messages, open a message and then hold the microphone icon to start recording. You don’t need to hold it the whole time. When you are done you can tap on Stop and then you can tap the up arrow to send the message. Messages expire soon after you play them. At the bottom of the Mail app screen, tap on the circle with three lines in it. This lets you filter your Inbox. By default, this will show you only unread messages. You can also tap in the center to change the filter if you need to see Flagged or if you want to only see messaged that are to you, cc’d to you, with attachments or only from a VIP. Gone are the days when you'll have separate apps for each aspect of your smart home -- now you'll be able to control your entire smart home straight from the Home app. Smart light bulbs, locks, thermostats, and so on -- all should show up in Home, as long as their HomeKit-enabled. The Home app is likely to play a bigger role in your life as time goes on and your home gets smarter, and its release makes sense if Apple wants to be competitive in the smart home business. When you open the Music app up now, you'll be taken straight to the "library" tab, which shows what you've been listening to recently and what you might want to listen to at that moment. That should help you avoid having to dig through your music to find something to listen to, and if you're halfway through an album that you want to finish, you'll be able to get straight to it. Other changes include lyrics embedded into the app and larger fonts for easier viewability. It's all about less time navigating inside and outside the app, and more time listening to songs.